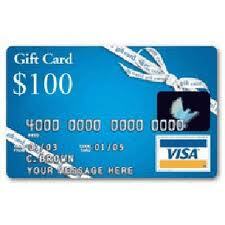 Enter to win a $100 Visa Gift Card for your Christmas Shopping! This giveaway is open November 29 through December 12, 2011 at 12:01 am. This is open to US and Canada residents only. Please use the rafflecopter entry form below. You may need to click “read more” and allow a few moments to load. The only mandatory entry is to ‘like’ us on facebook! All other entries are optional, but increase your chances of winning. Good luck! I could use this for holiday shopping. Great giveaway! Thank you so much for the wonderful giveaway! I would so be able to buy christmas for some of my family if I won this. I submitted a comment on your post about Peanut Butter & Co. I can’t wait to try it. Sounds delicious! this would help us out so much!! thanks for the opportunity! i could sure use this money! Would love to win this one. 🙂 Thanks for the giveaway!! I could really use this. Thank you so much. Thank you so much. This would be a great help! this would be great for holiday shopping thank you!!! I re-posted to my fan page. Under the one post per day for giveaway direct links. In the comments. I sure could use this! Thanks for the giveaway and a chance to win. I would love to win this! It would be great to use for presents for my daughter, niece, & nephews. it will be great to recover sum of my holiday dollars!!!! thanks for the giveaway! Perfect Giveaway for the season ! Great giveaway. Everyone can use a little extra holiday cash. thanks for the chance and for all that you do 🙂 Happy Holidays! Thank you for this oppurtunity to enter this and other wonderful giveaways! Thanks so much for this great sweep! I could sure use $100 for Christmas! Thank you so much! I really need this!! Another big blessing for the winner! Sure need this Christmas is looking grim around here. If I won this I would use it for couponing and help a few people out with Christmas! Thanks for the giveaway!! Really hope I win, could sure use! I could REALLY use this Gift Card! We are having a very tough year and cannot afford to buy Christmas gifts this year for our daughter. This would allow me to buy her a few items to put under the tree this year. Thanks so much for the chance to win such an awesome prize! Dawn, how old is your daughter? Wanted to say thank you for the these giveaways! Thanks much for the giveaway opportunity! this would be really helpful for the holidays! Great giveaway, thank you for the opportunity. Happy Holidays!! and thank you for the chance! My kids love getting money for christmas so they can hit the sales – im so proud of them. im having issues with the robocopter thing- not sure if i should proceed. 100.00 would be super awesome this time of year. This visa card can go along way with excellent sales. Thanks for the great giveaway and Happy Holidays! Never needed to win anything more. With a lay off next week I’m looking at no Christmas. I know people are worse off than me, but I’m terribly depressed right now. Fingers Crossed!!! Would love to win this one for Christmas!!! I have 4 kids so I could definitely use this! I really hope I did not already enter this one.. I don’t think I did. I’m just trying REALLY hard to win some extra cash this month as I have NO idea how I’m going to put gifts under the tree (that I cant afford either) for my daughter. Thanks for the opportunity for this wonderful giveaway!!! Thanks for having the giveaway! This will really help someone!! Thanks for the giveaway! Hope I win and then we could use it for Christmas. I would be soooo happy if I won this! Thank you for the opportunity. A great giveaway! Thanks for the giveaway! Nice site! Thanks for the giveaway. I love gift cards. Thanks for the contest. This will come in very handy this month. Any post–guess that includes this one! Could certainly use this. I would use it on my baby girls christmas presents since money’s tight this year. Thanks for a great giveaway! Keeping my fingers crossed bc we could def. use it this year! $100 Visa Card! now that would be a great win. thanks for the chance to win!! I would use this on our upcoming vacation! !